Based on Markus Zusak’s bestselling novel, The Book Thief (12A) tells the story of a young girl Liesel (Sophie Nelisse) in Germany during World War II. What’s it about? Narrated by Death himself, The Book Thief follows Liesel, a young girl who is sent to live with a foster family during World War II. Liesel finds solace from the brutal reality of war by indulging in stolen books and sharing them with others. However, when Max (Ben Schnetzer), a Jew, comes to Liesel’s foster family for sanctuary and protection from Hitler’s Nazi regime, Liesel’s life changes forever. Verdict: Markus Zusak’s The Book Thief is an innovative and inspiring story beautifully re-created for the big screen. The aesthetics alone are hauntingly striking; a snow-covered, war-torn German village that perfectly encompasses the scenery described by Zusak in the book with perfectly cast characters, allowing the audience to immerse themselves fully into the story of Liesel’s life and root for her the entire way. 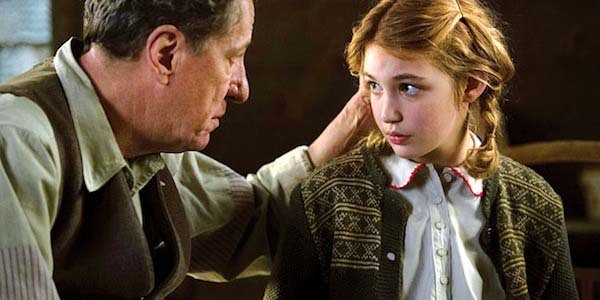 Just 13 years old in their feature debut, Sophie Nelisse and Nico Liersch, who plays Liesel’s best friend Rudy, are outstanding as the protagonists. Nelisse plays the complex character of a heart-broken girl who has lost everything in the war and she leads the film with a charm and charisma second-to-none. Her relationship with Max, the hidden Jew, is perhaps the most important element of the story and she plays it with such tender emotion it’s impossible for your heart not to ache as she tries to bring the outside world to the confines of the basement where he is hiding. Emily Watson also shines as Liesel’s stern but devoted foster mother Rosa; perfectly portraying her character’s many layers by maintaining a strict and brash exterior whilst keeping it clear that she loves both Liesel and her husband Hans more than anything. Hans though is arguably the star of the show; played by the brilliant Geoffrey Rush he is perhaps one of the most beloved book characters from the last 10 years and Rush, with the help of director Brian Percival, somehow manages to add even more warmth and charm to his live-action counterpart in a flawless embodiment of the character. 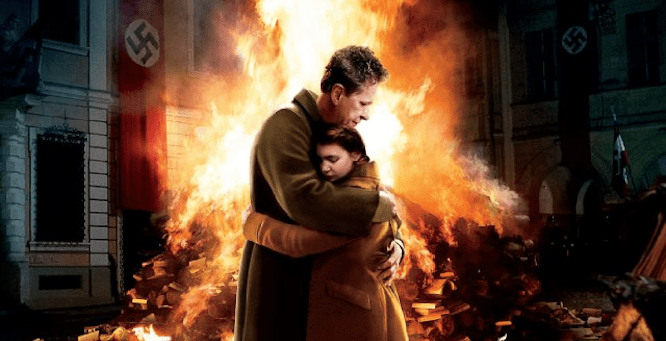 In particular, Hans’s relationship with Liesel is nothing short of heart-warming and will have you both laughing and crying throughout as you desperately will for nothing bad to happen to either of them. In addition to the lovable characters and heart-breaking narrative, the most captivating aspect of The Book Thief comes from its narrator: Death (Roger Allam). Prominent throughout the film in the form of an elusive and chilling voiceover, he offers great perspective as, in his own words, nobody served the Führer as loyally as he during the war. Death’s fascination with Liesel is the crux of the story and leads to his conclusion that after following Liesel’s life so intimately he is in fact haunted by humans. Final Words: When a best-selling book is adapted into a film, it very rarely goes so right. With the help of a breathtaking cast, astounding direction and author Markus Zusak’s incredible narrative, The Book Thief is the one to watch for 2014. Emotionally charged and beautifully told it will capture the hearts of everyone who watches. The Book Thief (12A) is released in UK cinemas on 26 February 2014.